In the wake of the Kennedy administration's abortive attempt at the Bay of Pigs to liberate Cuba from Communist dictatorship, Fidel Castro attempted to use his control over the freedom fighters of Brigade 2506 to extort a ransom from the United States. He named "farm machinery" as his price, and President Kennedy responded by informally organizing the Tractors for Freedom Committee–a nongovernmental committee of private citizens organized to facilitate the exchange. 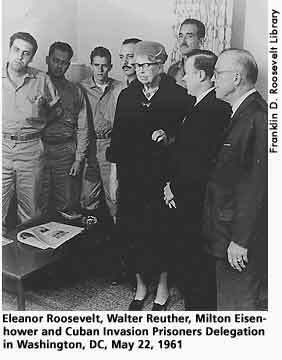 Under the chairmanship of Eleanor Roosevelt, Walter Reuther, Joe Dodge, and Milton Eisenhower also served on the committee. Kennedy encouraged public support for the work of the Tractors for Freedom group, but when the committee refused to meet Castro's exorbitant demand for close to $30 million in capital relief, they quickly disbanded. "Bay of Pigs: 40 Years Later." National Security Archive. Internet on-line. Available From http://www.gwu.edu/~nsarchiv/bayofpigs/chron.html. Black, Allida. Casting Her Own Shadow: Eleanor Roosevelt and the Shaping of Postwar Liberalism. New York: Columbia University Press, 1996, 193. The Bay of Pigs: A Collection of Documents from the National Security Archive.